BEIJING, May 16 (Xinhua) -- Chinese President Xi Jinping on Tuesday suggested aligning the Belt and Road Initiative with the European Investment Plan in order to inject new momentum into China-EU ties. 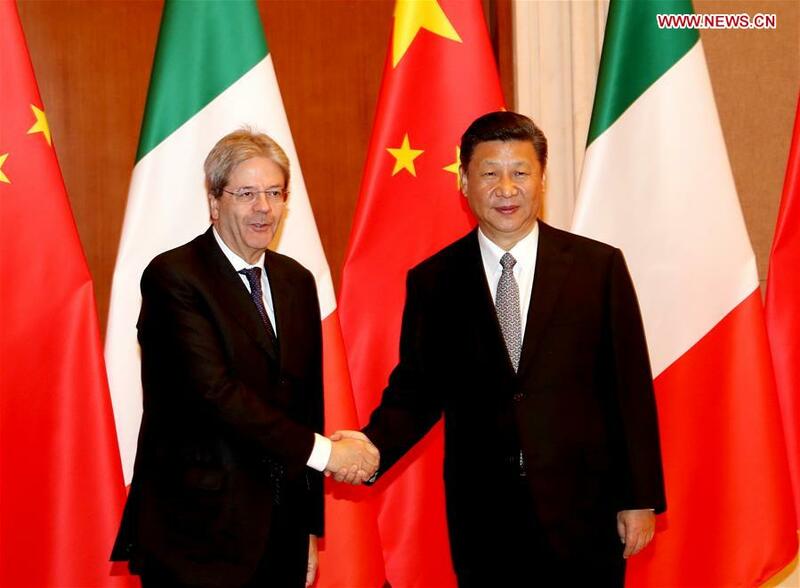 Noting that China and Italy both boast ancient civilizations, Xi said the two countries have been connected by the historic Silk Road. Both China and Italy are key members of the international community, Xi said. He urged the two countries to maintain the current momentum in high-level exchanges, as well as close contact between governments, legislative bodies, political parties and between regional authorities. China welcomes Italy to participate in the construction of the Belt and Road, and supports cooperation between the two countries in port management, shipping as well as ship building, he said. Beijing is willing to maintain communication with Rome on major international issues, and hopes Italy can play a positive role within the European Union in order to safeguard development of China-EU ties, he said. Italy is willing to participate in cooperation under the Belt and Road framework, particularly in the field of infrastructure, and to strengthen collaboration with China in areas linked to economy, technology, agriculture, public health, education, culture, tourism as well as small- and medium-sized enterprises, he said.